Avena sativa (oat) kernel colloidal oatmeal, bentonite, Butyrospermum parkii (shea) butter, cetearyl glucoside, citric acid, glycerin, glyceryl stearate, Helianthus annuus (sunflower) seed oil, hydrogenated castor oil, kaolin, phenoxyethanol, potassium sorbate, purified water, sodium stearoyl glutamate, xanthan gum. 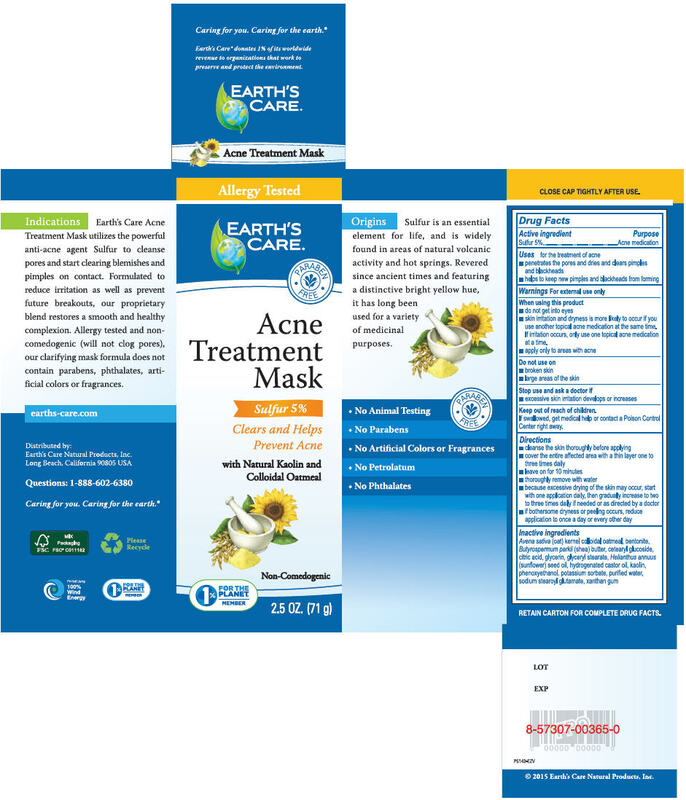 Earth's Care Acne Treatment Mask utilizes the powerful anti-acne agent Sulfur to cleanse pores and start clearing blemishes and pimples on contact. Formulated to reduce irritation as well as prevent future breakouts, our proprietary blend restores a smooth and healthy complexion. Allergy tested and non-comedogenic (will not clog pores), our clarifying mask formula does not contain parabens, phthalates, artificial colors or fragrance. Origins Sulfur is an essential element for life, and is widely found in areas of natural volcanic activity and hot springs. Revered since ancient times and featuring a distinctive bright yellow hue, it has long been used for a variety of medicinal purposes. ALLERGY TESTED.